Today, the 10th of Elul, is yahrzeit of Rebbe Pinchas of Koretz, a disciple of the Baal Shem Tov. The Baal Shem Tov once remarked of him, "A soul such as that of Reb Pinchas comes down to this world only once in 500 years." In 1790, Rebbe Pinchas of Koretz set out to journey to Eretz Yisrael in order to settle in Tzefat. En route, he fell ill and only made it to the Ukrainian shtetl of Shepetovka. One day while I was staying in Breslau, Poland, a Polish non-Jew appeared at the Jewish community house, carrying a package containing some papers. Attached to the outside of the parcel was letter. Upon opening the package we were astounded to find that it was the manuscript of the great Rebbe Pinchas of Koretz. The accompanying letter was written by Rabbi Pinchas Chodorov of Tarnov. It was written as a last will during the final days of the ghetto in Tarnov...I did not sit still until I had redeemed the manuscripts from the non-Jew, paying the full price - more than I could afford. I did this in order to present to the public the Rebbe's word's "that cleave with flames of fire." I pray to G-d that this merit will protect me and my dear family, and that it may be a memorial to the soul of my only son Meir and the other members of my family all of whom perished in the Holocaust, Hashem yinkom damam - May Hashem avenge their blood. To him into whose hands this manuscript may fall: These papers contain one volume of commentaries by the illustrious Rebbe Pinchas of Koretz, one of the disciples of the Baal Shem Tov. They are the only originals extant. They contain a vast treasure of priceless holy thoughts and insights...Since I left my home three years ago, a deportee, driven from place to place, I have carried these papers in my valise, never abandoning them - until now. Now that the "rage of the oppressor" has overtaken us (my dear wife and son and daughter have been stolen from me, may it be the will of our Father in Heaven that I will see them again), and we, the ones who remained, the life we face is precarious and we do not know what the day will bring. Therefore I decided to give these manuscripts which are so dear to me to one of my non-Jewish acquaintances who will hide them until G-d will return the captives from among His people. I fervently pray that the One Above has decreed that I may live, and that I myself will have the merit of publishing these manuscripts. But if, G-d forbid, my tracks will not be known, I ask him into whose hand this letter will fall, to be aware that Heaven bestowed on you this holy treasure in order that you bring to light the teachings of the saintly Rebbe Pinchas of Koretz. My request is that you include also my own commentaries, so that they be an everlasting memorial for me. My hands are extended to G-d in prayer that I may live to see the consolation of His oppressed nation and the return of G-d to Zion. 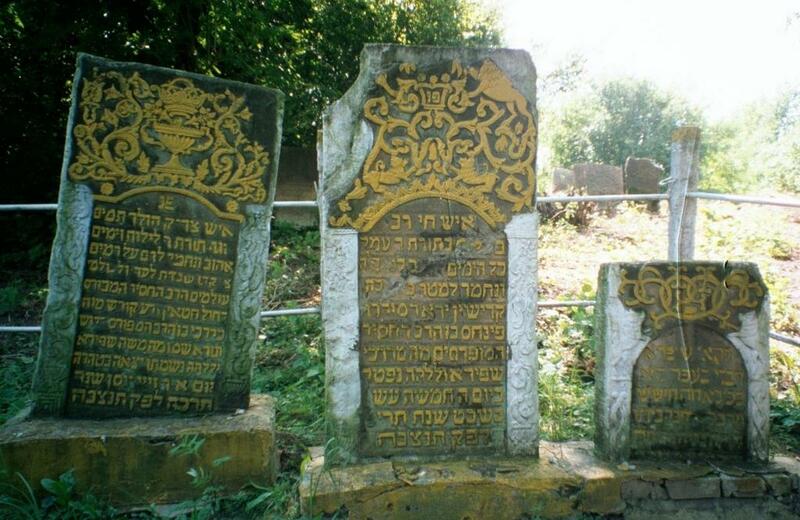 Gravesite of Rebbe Pinchas of Koretz in the Jewish cemetery in Shepetovka, Ukraine, one mile away from my family's shtetl. A month after I took this picture Ukrainian nationalists defaced these tombstones. Also, the previous "comment" is spam & you should probably remove it! R' Aharon Strasheler writes that there was a decree against the path of Chassidus in the time of the Maggid. The efforts of the Maggid & the Talmidim as well as of R' Pinchas of Koretz were only able to avert the decry if there was a man among them who had never even sinned in the slightest possible way (a shemetz of an aveira). The Maggid then informed the Talmidim that the decry was averted due to R' Pinchas - who had indeed been completely pure of even the slightest hint of sin. Woah. That was quite touching and chilling too. Hope you and your family are doing well SJ. Thank you for posting this touching account. Where is it from? the letter evokes much emotion. our ancestors' depth of devotion is humbling. The central matzeva is of R. Pinchas ben Mordechai Shapiro died on the 15th day of Shvat 5650. The famous R. Pinchas of Koretz was a son of R. Avraham Abbish, and died on the 10th day of Elul 5590 .The left matzeva is of R. Mordechai ben Pinchas died on 17th (? )day of Nissan 5665. He could very probably be a son of this R. Pinchas. As to the left matzeva, I could not read it. Is it of Imrei Pinchas? The central matzeva is indeed that of R. Pinchas Ben Mordechai SHAPIRO and he did die on Thursday, the 15th day of Shvat but the 15th day of Shvat did not fall on a Thursday in the year 5650. The year of death is anywhere between the years 5611 and 5619. During that period the 15th day of Shvat fell on a Thursday only in the years 5612 or 5619. The matzeva on the left belongs to R. Mordechai Ben Moshe SHAPIRO who was possibly a grandson of R. Pinchas Ben Mordechai SHAPIRO. Thanks for the links to my previous post and to my Two Tzaddiks web site. The information on the cemeteries and matzevot in Shepetovka was pieced together with the help of a friend, S. Cohen. There is additional info at http://twotzaddiks.org/part3.html. Regarding the date on the central grave, it's a little difficult to see, but I do believe the year is actually 5619. (The tet at the end is in the shadow.) But that will give you the 15th of Shevat on a Thursday. So the date would correspond to 20 January 1859.